Doxorubicin is an anthracycline antibiotic with antineoplastic activity. 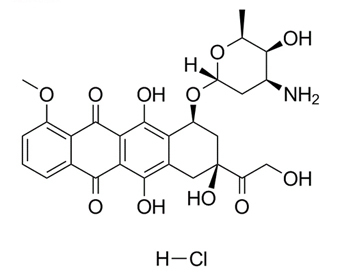 Doxorubicin, isolated from the bacterium Streptomyces peucetius var. caesius, is the hydroxylated congener of daunorubicin. Doxorubicin intercalates between base pairs in the DNA helix, thereby preventing DNA replication and ultimately inhibiting protein synthesis. Additionally, doxorubicin inhibits topoisomerase II which results in an increased and stabilized cleavable enzyme-DNA linked complex during DNA replication and subsequently prevents the ligation of the nucleotide strand after double-strand breakage. Doxorubicin also forms oxygen free radicals resulting in cytotoxicity secondary to lipid peroxidation of cell membrane lipids; the formation of oxygen free radicals also contributes to the toxicity of the anthracycline antibiotics, namely the cardiac and cutaneous vascular effects.
. Nitiss JL, et al. Targeting DNA topoisomerase II in cancer chemotherapy.Nat Rev Cancer. 2009 May;9(5):338-50.
. Sadeghi-Aliabadi H, et al. Cytotoxic evaluation of doxorubicin in combination with simvastatin against human cancer cells. Res Pharm Sci. 2010 Jul;5(2):127-33.